The term is used in Latin ludus to indicate the game, the show, the joke, but also the school (elementary) and therefore also the gym, or the place of training. Here, we are interested in precisely this sense, namely that due to the practical training of the gladiators, the ludus gladiatorius. The fights between gladiators, munera, were first introduced in Rome around the middle of the third century. BC, to celebrate the death of famous people. With the passing of years and the growing success of this type of show, the munera became a powerful means of political and electoral propaganda and frequency of performances went from sporadic, without a regular basis, to annual at the beginning of the I sec. BC. This passage, from show improvised and occasional to smooth and professional, demanded an increase in the level of competitive preparation of the gladiators and for this purpose were built the first gyms, the ludi. Within them, under the control of lanista, staying and were trained for shows those who are free men or slaves condemned to death, were destined to fight in the arena. Throughout the Republican period the maintenance and training of the gladiators, and the construction and maintenance of the ludus, were the exclusive prerogative of wealthy private citizens. It is very probable, if not certain, that every city with an amphitheater also had a ludus gladiatorius. Among the first ludi of the Republican era the most famous was, without a doubt, one of Capua where he founded one of the oldest and most famous schools of gladiators by C. Aurelius Scaurus. He was so famous and important that, as reported by the writer Valerio Massimo, it seems was used to train the legions to fight. Armorum tractandorum meditatio a P. Rutilio consule Cn. Malli collega militibus est tradita: is enim nullius ante se imperatoris exemplum secutus ex ludo C. Aureli Scauri doctoribus gladiatorum arcessitis vitandi atque inferendi ictus subtiliorem rationem legionibus ingeneravit virtutemque arti et rursus artem virtuti miscuit, ut illa impetu huius fortior, haec illius scientia cautior fieret. (The technique was taught the use of weapons to the soldiers by the consul Publius Rutilius, a colleague of Gnaeus Mallio: in essence he, contrary to what they had done all the generals before him, had come from the school of gladiators Gaius Aurelius Scaurus instructors and transmitted to the legions, by means of these, a more rational technique of defense and offense, and fused art and value, because this was enhanced by the impetus of that, that was made more cautious by a better knowledge of the trade). Also from Capua, and more specifically from the ludus of Gnaeus Cornelius Lentulus Batiatus, in 73 BC began the famous revolt of Spartacus. Equally famous were the ludi of Pompeii, Alexandria, Praeneste and Pergamum. The building, commonly known by the name of “barracks of the gladiators,” was actually built at the beginning of the first century BC with another function. It was probably intended as a place where spectators prior to and during the intervals of the shows, they could talk and walk or take shelter in case of bad weather, being functionally connected to the Teatro Grande in Pompeii according to the Vitruvian canon, based on model greek, behind the portico the scene, porticus post scaenam. The final destination, as ludus gladiatorius, was a consequence of the earthquake of 62 AD, when it was forced to abandon the older and smaller ludus, located in Regio V, near the Porta di Capua. This new feature of the building is largely confirmed by the findings on the inside of two boxes containing clothes parade, with gold embroidery, and a number of bronze weapons and armor, as well as murals and graffiti scenes of gladiators having as object. The original building, consisting of a quadrangle with 74 Doric columns and features a main entrance and passages communicating with the theater, was profoundly changed. I closed the service passages, the main entrance was equipped with a guard for access control, while all along the perimeter of the portico were built environments, on two floors, most of which was used for the cell ‘accommodation of the gladiators. Upstairs some larger rooms were is the accommodation of the lanista. Downstairs, in addition to housing the gladiators, there were other service areas, among them were identified a large kitchen with storage attached and identified as a local prison (as a result of the discovery of two skeletons inside and strains). The garden of the quadrangle was adapted to the area for training and fluted columns were covered and smoothed, only in the lower third, with stucco. While the smooth side was painted red, the upper two-thirds of the column, the grooved, was painted alternately red and yellow. Exceptions were the two central pillars on each side of which were painted in blue, as if he wanted to give the geometric references to subdivide the area of training of the gladiators. The history of the ludus ended a few years later, in AD 79, when, as the entire city of Pompeii, it was buried under ash and lapilli of Vesusio. Rome also had to adopt gyms for gladiators and the first, which gives news Cassius Dio, was to be near the theater of Pompey and go back to the mid-first century BC. The first ludus of the city for which you know the name is the ludus Aemilius. It is mentioned by Horace in the ars poetic. The name derives from its founder, who, according to some, could be the triumvir Lepidus or her self-titled first-born son. Another hypothesis identifies its manufacturer Marcus Aemilius Scaurus, who during his curule aedile in 58 BC, he organized and memorable venationes munera. Its location is not certain, and it is thought that it was mostly located in the Campus Martius, near the first stone amphitheater built in Rome, to Statilius Taurus. Probably lost its importance in AD 64, when a fire destroyed the amphitheater Statilius Taurus along with much of the city. On the other hand, we know that in the fourth century it was transformed into a private bathroom (balneum) and assumed the name of balneum Polycleti. During the imperial age the gladiatorial schools and the organization of munera pass under the protection and authority of the prince, both in Rome and outside, manages them through its delegates, procuratores. This step is sanctioned when Julius Caesar Augustus inherits from the ludus in Capua, founded by him in 49 BC. From this moment on, the gladiatorial shows will be organized only by the emperor, as a gesture of generosity toward the people, and the Questors that, from the reign of Emperor Claudius, they will be authorized and obliged to do so at their own expense. About the physiological reflex of closing the eyelids in the presence of a threat Pliny recalls that among the twenty thousand gladiators maintained by Caligula in his ludus private, there were only two who could never close the eyelids, and that because of this peculiar capacity they remained unbeaten. A special case was that of the emperor Commodus who, fascinated by the ars gladiatorial, even decided to transfer his residence in the Ludus Magnus. He called himself by the name of a famous gladiator who died in combat, trained and fought in the arena and went so far, on the occasion of the festivals of Saturnalia, to subvert the custom to leave the palace to do so from the ludus at the head of a parade of gladiators. In 72 AD the emperor Vespasian starts the construction of the largest and well-known amphitheater in the world: the Flavian Amphitheatre, the Colosseum, originally known as Amphiteatrum. In 80 AD, before it was even completed the construction work, it was inaugurated by Titus and subsequently completed by Domitian. It was in the latter is attributed to the construction of the ludi quattuor, the four gladiator gyms in Rome, as evidenced by the so-called Chronograph 354 AD. From the Regional Catalogues know that they were called respectively ludus Gallicus, ludus Dacicus, ludus Magnus and ludus Matutinus, all positioned between the Opium and the Celio hill, near the Flavian Amphitheatre, and overlook the square dell’Amphiteatrum. Its name comes from the initial presence of Gallic gladiators, according to the Curiosum and the Notitia, was located in the Region II, near the ludus Matutinus, which was to be the same size. The origin of its name is perhaps due to the fact that it was initially intended to accommodate the prisoners of the Dacian wars destined to the munera. Its location remained uncertain for a long time, in fact, put him by the Curiosum in Regio II and by the Notitia in Regio III. Precisely the latter, as a result of recent studies on the fragments of the Forma Urbis, seems to be the exact position. Situated between the exedra of the Baths of Trajan and the Ludus Magnus, had the same dimensions of the ludi Gallicus and Matutinus and was provided with an arena and an auditorium elliptical, enclosed by a rectangular wall, decorated on the outside by a colonnade. It was the place where they trained gladiators bestiarii, who performed in the fighting with animals, the venationes, and should presumably its name to the fact that these shows were held in the days of gladiatorial munera in the morning. The Cataloghi Regionari place it in the Regio II and the first to assume its location between the templum divi Claudi (temple of divine Claudius) and the vicus Capitis Africae was Lanciani in his Forma Urbis Romae, this assumption turned out to be correct when the Colini, during the excavations on the Celio, in 1938, brought to light the remains of foundations of a parallel elliptical auditorium and a sewer system with brick stamps of the Flavian period. Later there were found remains of walls that date back to the earliest period, probably reused for the construction of the ludus Matutinus. This may support the hypothesis that the Matutinus would have been made on a previous ludus bestiarius, already mentioned by Seneca. 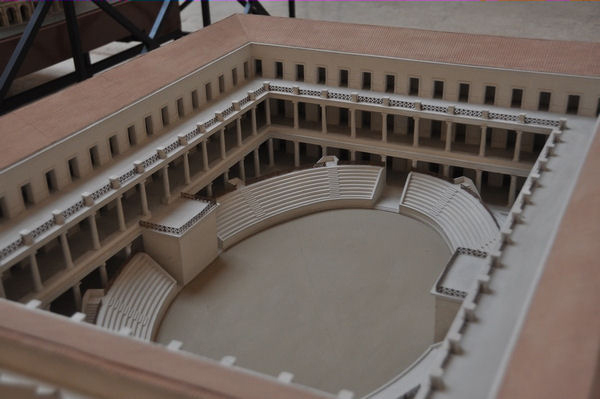 It was the largest and most important of the ludi in Rome, directly connected to the Colosseum by an “umbilical cord”, an underground tunnel that we will mention later. Just from these characteristics derives its name Magnus which in Latin means big, important. It is the only of the four ludi of which can still be seen, even if only partially, the floor plan. The first news of this ludus there were literary sources, the Regional Catalogues, and epigraphic, in which is also often referred to by the letters in L. M.
Only around middle of the sixteenth century came to light a fragment of the Severan marble plan, which, in addition to quoting almost the entire floor plan, went etched his full name. The Regional Catalogues place it in the Regio III, but its exact location was long debated by archaeologists over the years. Luigi Canina, after a long and careful examination of the fragment and its place in the plant Severian, had positioned near its actual location, while the Lanciani, in his reading of the Forma Urbis Romae, was misled by the remains found in the hill Oppio. One who, however, guessed the exact position it was Hülsen that, in his work on topographic Rome, placed it exactly where it would come to light during the excavations in 1937. 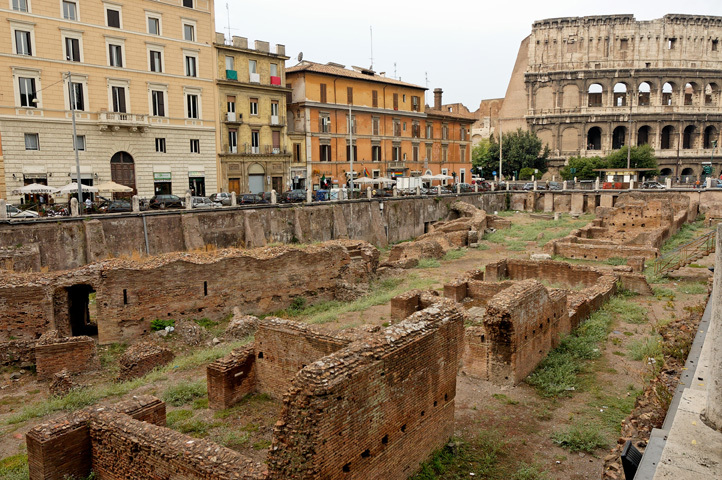 The visible ruins are among the Piazza del Colosseo, Via Labicana and Via S. John Lateran. From archaeological investigations it was established that the Ludus Magnus was built on previous buildings were destroyed during the fire of 64 AD, a domus of the Republican period, which were found during excavations mosaic floors, and craft shops, dating back to the the early years of the Empire. 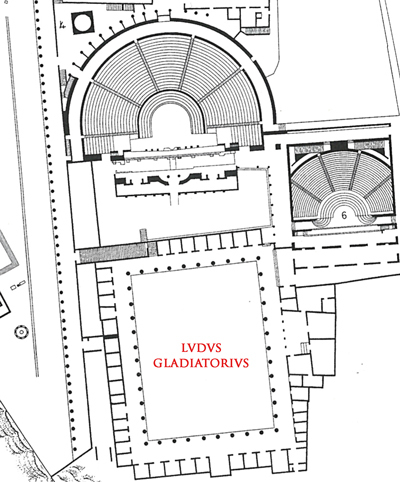 What we see today is not the original ludus of Domitian, but a remake next Trajan period, which led to an increase of the whole complex, except for the floor of the arena, of approximately 1.5 meters. 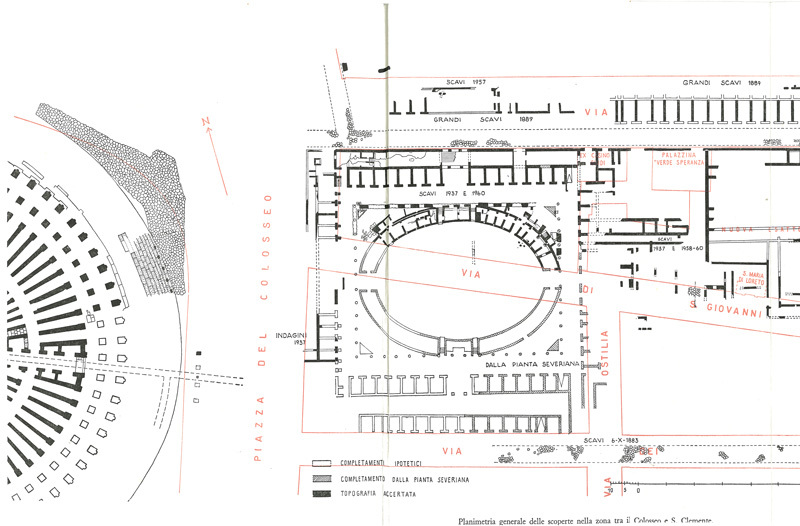 The plan of the building follows the guidelines of the barracks, see for example those of vigiles of Ostia, with the only exception of the cavea and the elliptical present at the center of the arena. Built of brick, it had to have two or three floors. The arena, which measured 210 x 140 Roman feet (62.15 m. X 41,45 m.) and was in a ratio of 1:2.5 compared to that of Amphiteatrum, could be reaching using two large main entrances along the major axis and through narrow passages of the seats in the auditorium along the minor axis. The cavea, which surrounded the whole arena was equipped with 9 steps and along the minor axis, two platforms for the authorities. It is estimated that it could hold about 1,200 spectators. The inner wall to the arena and inputs to the same were covered with marble, in testimony that the ludus was attended by prestigious personalities, and further investigation, it was established that there was a metal balustrade to divide the lower part of the cavea of the arena. To access the auditorium were built outside the four scales, while the boxes were accessible to the authorities, most likely through passages connecting them to the second floor of the gym. The environments are under the cavea were presumably used as warehouses. The auditorium was placed inside a rectangular courtyard surrounded by a portico with Tuscan columns, on the ground floor and Ionic columns, upstairs, of which only a few ruins remain. At the corners of this rectangular courtyard were four triangular fountains, currently only one is visible, visibly restored in the western corner. On the portico, and in particular on the sides north, west and south, looked out of the rooms, all of similar size (about 20 square meters), except for those stations which will be discussed later. These premises were equipped with a door and an opening above it which acts as a window, given their height, presumed by archaeological surveys of about 4.2 meters, this was almost certainly a loft. Their intended use was that of housing for the gladiators in the ludus, which probably slept on pallets on the floor. At the corners of this quadrangle of the stairs gave access to the upper floor. We before mentioned to the central environments on these three sides, which differed in size from the others and that were used as access to the gym. In particular, the central room, located on the north side has been identified as the monumental entrance to the ludus, which is accessed from the street currently corresponding to the Via Labicana, via a ladder. The central room on the west side, the one facing the amphitheater to be clear, it should be, instead, the main entrance to the gym. The only fully visible in the ludus is still to the north, where, at the back of the cells of the gladiators, there was a long service corridor paved in opus spicatum. Different from the other three sides, the eastern one has, in addition to environments similar to the cells, a large central environment at the major axis. This environment, sized 21 m. x 17 m., was accessible from the portico through five entrances separated by columns and was, presumably, the shrine of the imperial cult. One more peculiarity of this building was the tunnel that connected directly to the Colosseum. This underground passage led from the southwest corner of the ludus with one of four underground tunnels of Amphiteatrum. The tunnel, 2.17 m wide. long and about 84 m. has travertine walls and had to have a wooden ceiling, up to the height of the porch outside of Amphiteatrum, while the rest of the way, until the ludus, has brick walls and ceiling. It allowed the gladiators to achieve Amphiteatrum directly from Ludus Magnus without being seen. Currently it is no longer passable because interrupted by the construction of a sewer. We omit to mention the various categories of gladiators, and their division into familiae, who lived within the ludus, to focus instead on those figures who ran or worked there and within that we have learned through epigraphic evidence. The management of the ludi is delegated by the emperor to the procurator, that in the case of Ludus Magnus is of equestrian rank high and is called procurator duecenarius, resulting from the fact that he received a salary of 200,000 sesterces a year. The inscription below this position is specified by the initials CC (duecenarius). In the case of the ludus Matutinus the procurator was of lower rank and was called procurator sexagenarius. The procurator was assisted in turn by a subprocurator and subordinate personnel. the clerk arms, praepositus armamentarium. A gladiator who fought for the game, pegnarius, and today we would call a court jester. 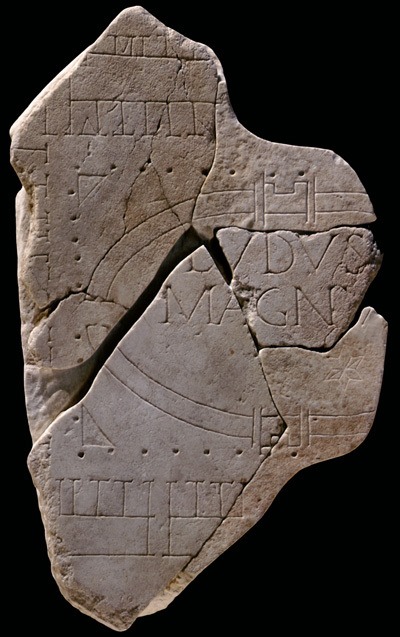 This inscription confirms the existence of guardians involved in underground premises inside the ludi, Cryptae, for the custody and detention of gladiators or convicted, damnati. Obviously the doctor, medicus, which you could not really do without. Another unusual inscription, unfortunately incomplete, it may refer to a horn player, cornicen, or a helper to service, perhaps the procurator, cornicularius. Probably the latter is more true, even if the presence of instruments such as the horn and tuba, as an accompaniment of the gladiatorial shows is likely, especially in light of recent studies on the musicians employed in the amphitheater and in the ludus. 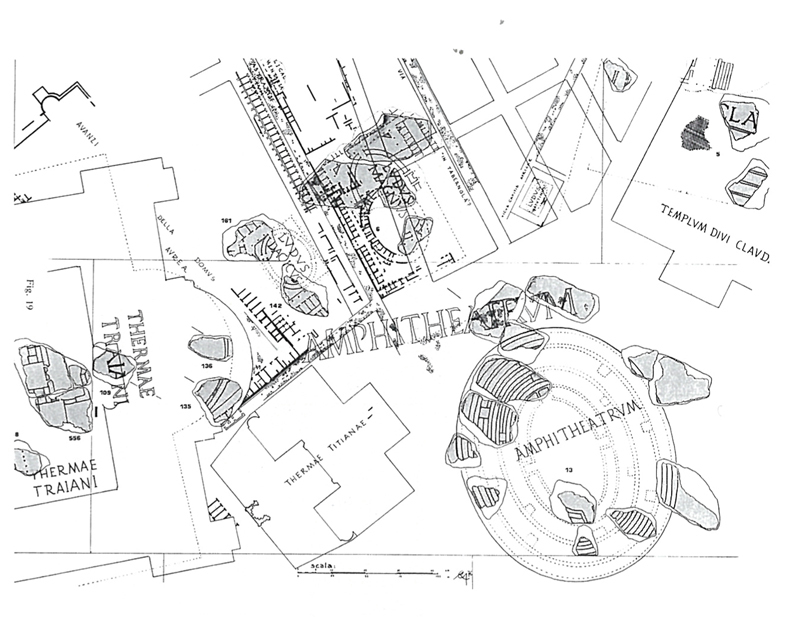 Let us now briefly consider those buildings that were connected and functional at the Amphiteatrum and ludi. Nearby the Amphiteatrum and particularly to the east of the Ludus Magnus stood the Spoliarum, the Saniarium and Armamentarium (in the Regio II) and the Summum Choragium and Castra Misenatium (in the Regio III). The spoliarium, that he should not be large, it was the place where the dead and dying were brought. The Saniarium was the place where they were cared for the wounded gladiators. The Armamentarium was the main armory, much larger than those of ludi, where the weapons were kept to be delivered only in the run up to the gladiators fight, for obvious security reasons. The Summum Choragium was the warehouse for machinery and means for the sets. Has to the name of summum, probably because it reports directly to the emperor. It was administered by a procurator, as shown by some of the numerous inscriptions that remember him. The Castra Misenatium were the barracks of the sailors of the fleet of Misenum that were posted to Rome for the management of velarium covering the Amphiteatrum. The history of the ludi, and in particular that of Ludus Magnus, ends with the end of the gladiatorial games. In 325 A.D. Emperor Constantine abolished by decree, the fighting gladiators and condemned to Ludum, but the ultimate demise of these shows was under the Emperor Honorius. From this moment onward, we will not have more news of the Ludus Magnus until, in 1937, Antonio Maria Colini will begin to bring to light the remains of what has been, and always will be, the largest and most important ludus of ancient Rome, the ludus Magnus.